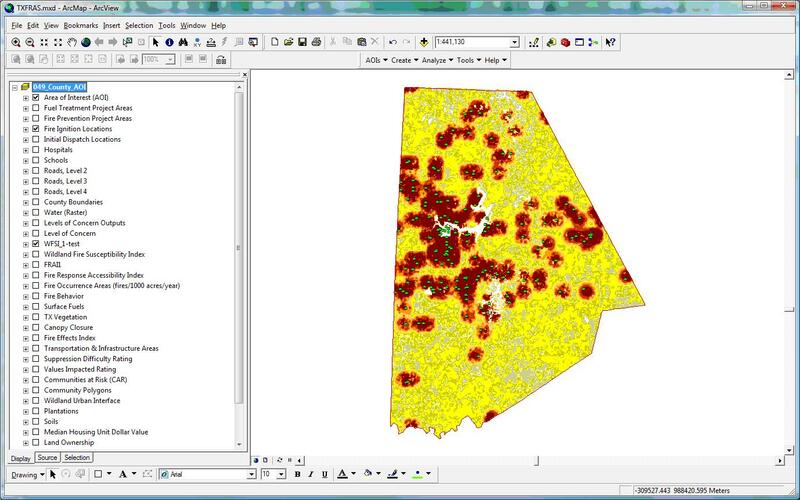 GIS software is essential for predicting and managing wildland fire risk. Applications have been developed by Kingbird Software, LLC. in contract with The Sanborn Map Company, Inc. as well as with Benchmark Research and Safety, Inc.
Wildland Fire Management, Benchmark Research and Safety, Inc.
Kingbird Software has provided consulting and development services on several wildland fire management related GIS projects. In addition, custom maps have been created for Idaho suicide rates by county, Idaho alcohol use by county, and Idaho zip codes. Wildland Fire Risk Assessment System, The Sanborn Map Company, Inc. The Fire Risk Assessment System was built for various states and federal agencies. The application is an extension and toolbar for ArcGIS that combines wildland fire susceptibility (potential occurrence and fire behavior) fire effects (values at risk) and fire response accessibility to generate outputs showing "Levels of Concern". The application allows users to change model inputs to generate new outputs for scenario planning. Ken Bunzel was the primary developer for this software as an employee of Sanborn Map Company. Kingbird Software has contracted with Sanborn for continued software development as well as maintenance and support for this project. Numerous bug fixes have been provided in the last several years. The following additions have been added: Fire Prevention Tool, Fire Behavior Outputs, Fuel Profile Editor Tool, statewide base layers, and Dollar Exposure Tool. Enhancements have been added to the following tools: fuel treatments, Wildland Fire Susceptibility Index (WFSI), Level of Concern (LOC), and Areas of Concern (AOC). The original SFRAS application has been modified into a more generic application called WFRAS with data support for additional states and federal partners. 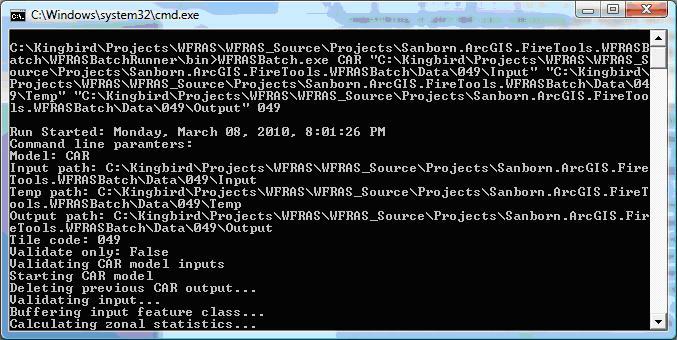 WFRAS Models Batch Tool, The Sanborn Map Company, Inc.
Kingbird Software contracted with Sanborn Map Company to create tools to run GIS modeling processes in batch runs. The tools are used by Sanborn to generate wildland fire susceptibility, communities at risk, and levels of concern GIS datasets for use in the Wildland Fire Risk Assessment System. Development and maintenance of these tools is ongoing. FireSite, Benchmark Research and Safety, Inc.
Kingbird Software is providing software development services for the FireSite project. FireSite is a GIS based web service that simulates fire spread under defined conditions. LandFire fire behavior map layers are clipped and merged for a user defined area using the GDAL open source GIS library. These layers are then input into FarSite to produce a fire perimeter output layer that is displayed to the user on top of a Virtual Earth base layer. Fire Program Analysis (FPA) project, The Sanborn Map Company, Inc.
Development of a prototype Wildland Fire Susceptibility Index (WFSI) and Large Fire Index (LFI) for the Northwest Montana Fire Planning Unit (FPU). The application was based on the RMS application and modified for this project. This project involved spatial analysis using raster datasets. RMS Wildfire Risk, The Sanborn Map Company, Inc. Wildfire hazard, threat and susceptibility were analyzed using spatial analysis on raster datasets. A simple command line user interface was developed to provide batch processing of inputs for internal company use. 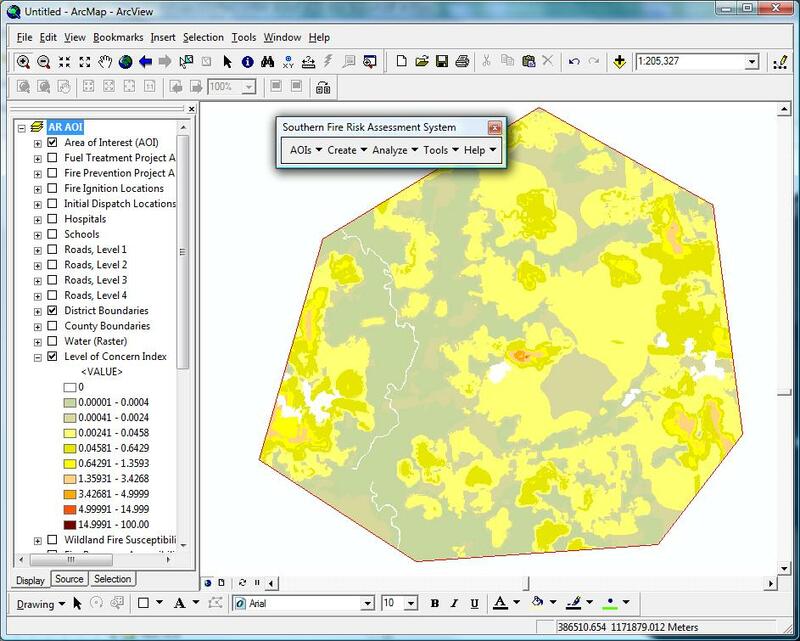 This application used ArcObjects and the Spatial Analyst extension. This was developed for Risk Management Solutions, Inc.
Southern Fire Risk Assessment System, The Sanborn Map Company, Inc.
Sanborn developed a Fire Risk Assessment System for 13 southern states that combines Wildland Fire Susceptibility (potential occurrence and fire behavior) Fire Effects (Values at Risk) and Fire Response Accessibility to generate outputs showing "Levels of Concern". The application allows users to change model inputs to generate new outputs for scenario planning. 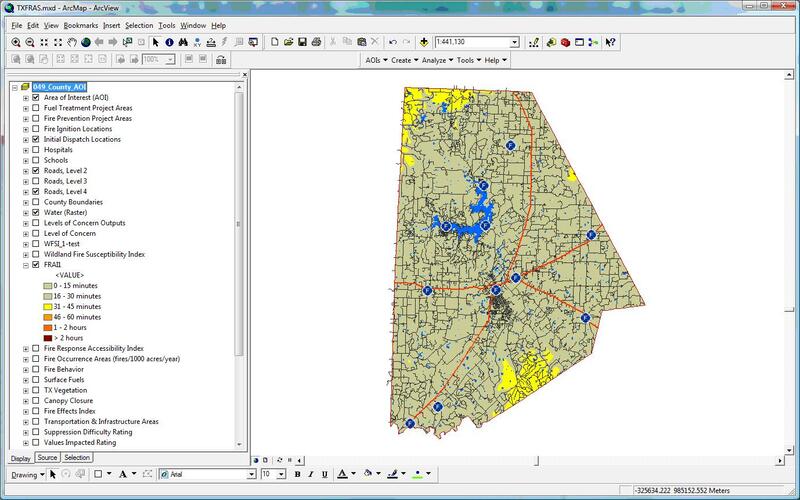 Mr. Bunzel has worked as a GIS developer for this ArcMap .NET application while employed with Sanborn. Space Imaging has developed a Fire Risk Assessment System for the State of Florida that combines Wildland Fire Susceptibility (potential occurrence and fire behavior) Fire Effects (Values at Risk) and Fire Response Accessibility to generate outputs showing "Levels of Concern". The application allows users to change model inputs to generate new outputs for scenario planning. Mr. Bunzel has worked as a GIS programmer for this application while employed with Space Imaging, LLC. This project involved creating a GEOBOOK for Insurance Services Office that predicts fire hazard conditions based on classified satellite imagery. The GEOBOOK was written by Mr. Bunzel using Visual Basic and MapObjects software. The application has the look and feel of a guide book with tabs and includes text, pictures, and interactive maps. One interactive map allows the user to click on a polygon to display fire hazard, slope, and access information. Another function allows the user to locate a specific address on the map by simply typing in the street address. There are links in the interactive mapping that will "turn the page" in the GEOBOOK and display pictures depicting examples of a particular fire hazard condition. Mr. Bunzel developed applications for the Forest Service for analyzing forest resources and creating maps of historical fires. 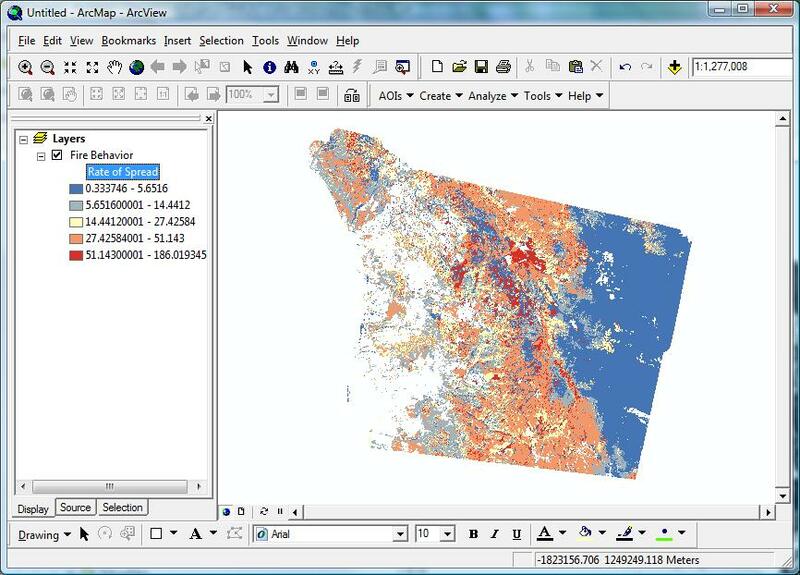 One project involved an ArcView application using the Spatial Analyst extension to analyze likely travel times to historical fires given today’s fire-fighting resource allocation. This application incorporates travel through roads of varying speed limits as well as overland travel through various vegetation types and slopes. The purpose of the application is to find better ways to allocate fire-fighting resources.